Our Automotive Conversations Platform® automates service appointments, scheduling and reminders, while making it fast and easy to share information and get approvals from customers. The platform also automates your Customer Satisfaction Index (CSI) and questionnaires, and enables online payments all through a single, user-friendly interface. What’s more, all conversations are documented for easy tracking. Dealerships already using our Automotive Conversations Platform value the way it helps them increase revenue, improve productivity, and boost customer satisfaction. Service advisors like how it improves their efficiency. By removing communication obstacles, conversions rise, run time drops and customer loyalty increases. A customer is looking for a second-hand car on a used car portal. He likes the look of a car that’s for sale. But a previous bad experience makes hime hesitant to travel to the dealer for a test drive. It once took him an hour to reach a dealership, only to find the car he was interested in was reserved by someone else. The reservation wad not yet visible on the website. Even outside office hours, the dealership is able to service its customers by using our Automotive Conversations Platform©. This enables customers to handle their personal business in their own time, just the way they like it. During the buying process, customers run the risk of travelling to a dealership for a particular vehicle that they’ve seen for sale on the website, only to find that the car has been reserved or already sold. When using the Automotive Conversations Platform©, customers can instantly check the availability of a car, without having to call or drive. As a dealer, you want to make sure your prospect is licensed. Having the prospect upload his driving licence during the chat makes your administrative process faster. It’s super-easy for the agent to access all previous information provided by the customer. This way the customer doesn’t have to repeat any details. 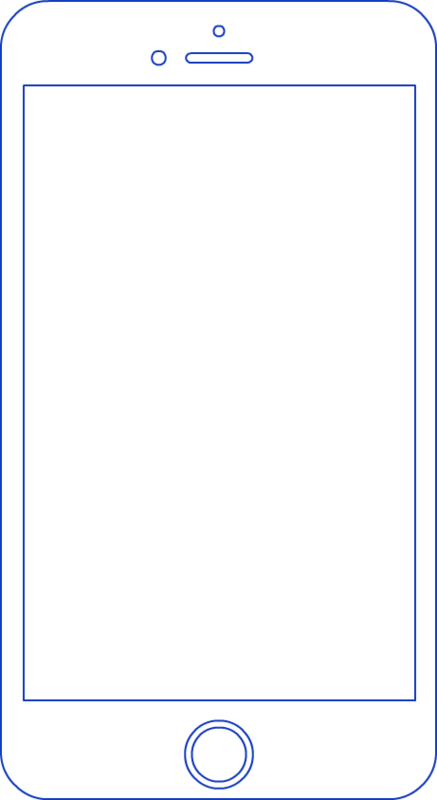 This information is captured in your company knowledge base. All information, like special offers and campaigns, is presented to agents proactively. At the same time, it’s a database that’s as easy to search as Google. Winter is coming so a customer has to make an appointment for a tyre change. Last time she did this, she had to visit the garage’s website to book an appointment using a time-consuming set of webforms. It was quite a hassle. She had to fill in all her contact details and licence plate, even though she had been a customer for several years. The garage switched to the Automotive Conversations Platform© and the customer’s experience is completely different this time. Because she provided her mobile number, we’re able to recognise the customer. We already have data like her name, address, licence plate and the dealer location. So we don’t have to ask for these details again. Because we have digital contact, an appointment proposal can be sent directly from the Automotive Conversations Platform© to the customer with the right time and location. The appointment can be added to her diary with just one click. As a result, we service the customer and reduce the number of no-shows. At this point, a chatbot takes over the conversation. This makes servicing the customer much more cost-efficient. The customer’s life just got a whole lot easier. 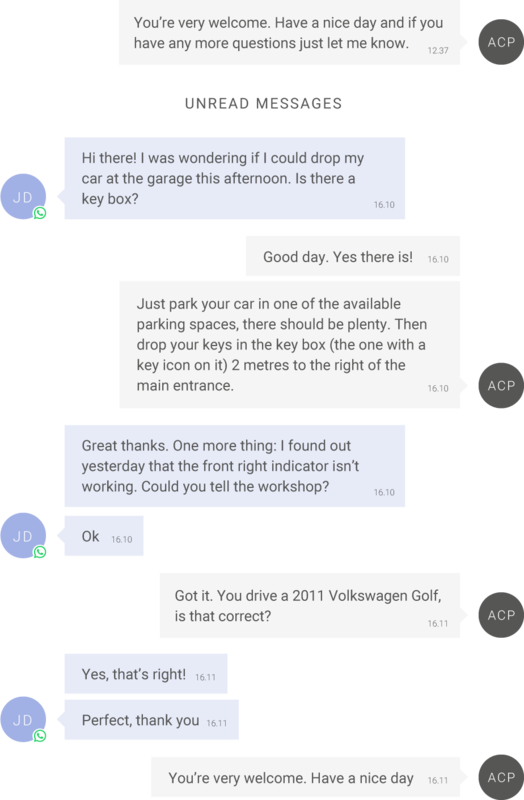 Not only in communicating with the workshop, but also when picking up her car. She doesn’t have to wait in line and handle all the paperwork at the desk. She just picks up her keys and can to get on with her life. Just the way she likes it. Trusted by over 1024 auto businesses.